The information below is from WO169/949, which can be found in the National Archives in Kew, and German sources which can be found at NARA, in Washington, in particular the D.A.K. war diary. It is quite interesting to see the medium artillery situation in the Middle East at this date. While a lot of ink has been spilled looking at the tank situation, and the technological problems faced by the Commonwealth, much less analysis has been made on the artillery, apart from the anti-tank guns, of course. This is probably in part because at least in the field artillery sector, and in the light anti-air sector, the Commonwealth was quite superior to the Axis forces. I am indebted to my friend Jon who pointed this out to me. For field artillerty, the Commonwealth 25-pdr field gun was a superb gun, which served well in a dual role, as demonstrated by e.g. 1 Field Regiment at the Omars on 25 November, and also of course in the field artillery role. This superiority was noted by the Germans, who recognised that Commonwealth field artillery was a nuisance. While the Axis divisional artillery had superior calibre, and in particular the Italian 105mm field gun was recognised by the Commonwealth as a very good gun, the large numbers, range, versatility, and mobility of the 25-pdr were hard to beat. In the anti-air role, the 40mm Bofors AA gun was also a very good alround design, and superior to the 20mm light AA guns fielded by the Axis forces. In the CRUSADER period it doubled as anti-tank gun, when required. In the field of medium and heavy artillery however, the Commonwealth was severely lacking. Heavy artillery, there was none at all, and for medium artillery, there were few guns, and more than half of them obsolete. The Axis forces on the other hand had some superb guns in Africa in this sector – the captured French 155mm GPF gun, the Italian 149/40 gun, the 17cm K18 gun, and the 21cm Mortar 18. They only had small numbers of these, but still more in total than the Commonwealth could field. Furthermore, most of these guns were concentrated under the Army artillery command Arko 104, while the Commonwealth medium regiments were penny-packeted to the Corps, and often operated on a battery basis. The reason for this was of course that the Axis was planning a major assault on a fortress, and had brought in a siege train to undertake it. Below the army artillery, the standard heavy piece of German divisional artillery, the 15cm heavy howitzer 18, while outclassed inRussia, was superior to the Commonwealth 6″ howitzer as well. On 4 November the Commonwealth forces reported a total of 126 medium guns in the Middle East, 28 of which were the modern 4.5″ gun , while the remainder were the obsolete 6” howitzer, the even more obsolete 4.5″ howitzer, and 18 155mm howitzers. 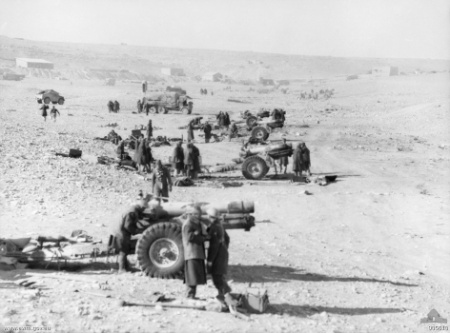 11 4.5″ howitzers were in the Western Desert, 10 in Tobruk, and 1 with the L.R.D.G. 16 of the 155mm howitzers, were with 1 Australian Corps, and another 2 155 mm howitzers with the schools in the Delta area. It is likely that of the remainder at least 16 6″ howitzers of 64 Medium Regiment were not in the Western Desert, but also rather in Syria with 1 Australian Corps. Thus the total of available medium guns in the Western Desert was brought down to 63, or a bit more than half the number of Axis mediums. Most of these guns were obsolete. At the same time, while there is some confusion, Panzergruppe Afrika and the Italian forces appeared to be able to field up to 115 medium guns (>105mm), of which a large part were of superior quality to the Commonwealth guns. It was this discrepancy which contributed a lot to the problems the Commonwealth forces were facing in the static fighting around Sidi Rezegh, and the Tobruk corridor. I am indebted to Nigel Evans’ superb site on the Royal Artillery for much of the information here. The Commonwealth 4.5” gun, which equipped one regiment and one battery at the time was better in some aspects compared to the German 15cm sFH, such as its superb range. It was outclassed however by the Italian Ansaldo 149/40 gun. The 4.5″ gun lacked destructive power and range by comparison, with a shell and explosive weight of only about half of that of the Ansaldo, and there were in any case not enough of the guns around. It’s main use was for counter-battery, and while it was certainly superior to the German 10cm K18, which served the same role, it could not compete with the heavier Axis pieces such as the 17cm K18, and the Ansaldo 149/40 guns. The 6″ howitzer was one of the weaker medium guns in theatre at the time. It fired a relatively low-weight projectile, and its range was not impressive. During the desert war it was replaced by WW1 vintage 155mm howitzers (see below) and then 5.5″ guns. During the period, about 100 155mm Howitzers M1918 of WW1 French design (but modernised between the wars, e.g. to enable being trailed behind trucks) were in the process of being delivered to units as lend-lease by the USA, but these were not in the Western Desert yet. On 4 November they were equipping only an Australian medium regiment, 2/13, in Syria. A further 12 were already in ordnance depots, and 78 were en route with various convoys. By 12 February, only one regiment, 64 Medium Rgt. RA had been re-equipped with 16 of these howitzers, and 2 4.5″ guns. A French-built 155mm howitzer of 212 Battery, 64th Medium Regiment, Royal Artillery, 23 July 1942. The 4.5″ howitzer was probably the weakest medium gun (in fairness it is more a field gun, rather than a medium, despite its calibre of 114mm being a bit more than the standard 105mm) in service in the desert. It’s relegation to the static role in Tobruk says as much. It was a pre-WW1 design which had been modernised in the 1930s to enable truck-towing. It’s range was only 6,600 yards, and the shell weight was only 37lbs. The guns go off as the crew of a 4.5 inch Howitzer of the 2/1st Field Regiment RAA are given the order to fire during the cooperation artillery shoot with 107th (SNH) Royal Horse Artillery at the Bir Asley Artillery Range. What the table makes clear is that while the Commonwealth was deficient on 4 November 1941, it was also foreseeable when this situation would improve considerably, and at least in numbers, if not in quality, the Royal Artillery in the Middle East was due to become superior to its opponents. This entry was posted in Content and tagged Artillery, Commonwealth forces, medium artillery. Bookmark the permalink. Are you sure about that? It’s a while since I’ve looked at it closely, but I’m reasonably certain that these 4.5-in were the old WWI hows rather than the modern sibling of the 5.5-in. I can check in the 7th Mdm Regt history and Farndale’s ‘Years of Defeat’. WO169/949 definitely states ‘4.5″ gun’. I understand the old (pre-WW I) ones were 4.5″ howitzers? Yeah. I had a look in the 7th Mdm history, and they received the new 4.5-in guns around the middle of 1941. Apologies for the tangent. Not too worry, made me go back and look it up! I added info on the 4.5″ howitzers, which I overlooked (it was in a different file), and which maybe the origin of the confusion. I wonder if these were with 144 Field? Most of high calibre Italian guns were the rigid mount 149/35. The modern and excellent model was the 149/40 but only 12 available for Africa(the other 36 went Soviet Union attack), they were appeared only in later stages of desert war and certainly they effect was minimal. So earlier there was the obiquous 149/35 and a small number of 152/37 came in 1941. There was also the fortification/naval guns and mortars like 210/8. Many thanks for your comment. The Australian 155mm guns were Schneider M1917 howitzers, presumably manufactured in the USA, and I presume fitted with road wheels for motorised use. The Germans had two French 155mm guns in operation, captured GPF (a completely different gun, similar to the ‘Long Tom’ US gun), and M1917 Schneider howitzers which had been bought in Tunisia and arrived around the start of CRUSADER. These were technically identical to the Australian guns, but for the wheels, which were still the old-style wooden spoke wheels for horse-drawn movement. Hello; as for the alleged four 4.5 inch guns at Tobruk, there are reports elsewhere on this site and elsewhere (Hogg for example) that those guns were actually 60 pounder Mk. 2s on the Mk. 4 carriage, not 4.5 inch guns (unless they were the early Mk. 1 version of that weapon, which were essentially relined 60 pounders and are almost identical to them in appearance). The 155 mm howitzers were indeed ex-U.S. French Schneider C17S field howitzers, which was designated as the M-1917 in U.S. service. The M-1918 was a licensed wholly U.S. made copy of the C17S. It could be distinguished from the French original by its straight shield and changes to suit U.S. manufacturing techniques. The photo seen above in this blog is of a French made gun. I do not know Hogg’s source, his was probably from IWM, Woolwich or regimental histories though. Hogg is great for U.K. and Commonwealth artillery, other countries less so. However, there is at least one mention I have seen elsewhere on this site of 4 Australian 60 pounders. There is a also photo taken from the breech area of one of these Australian guns at Tobruk that I have seen recently on the Australian War Memorial site. It was a 60 pounder Mk. 2 on Carriage Mk. 4R, i.e. the post First World War version with the wooded wheels and solid rubber tires. And, yes, you are correct, the 155mm howitzers in 8th Army were indeed ex-U.S. Army French made C17S’ (designated M-1917 in the U.S. military), not the later fully American made copy of the C17S designated as the M-1918. I found the photo, it is on Australians at War. The gun is on a Mk. 4 carriage, i.e. the wood artillery wheels were still steel tire shod, unlike the slightly later ca. 1919-1920 vintage Mk. 4R with the solid rubber tires. Can we post photos here? Hi Wesley, sorry for the delay. Email it to me at a[dot]biermann[at]gmail[dot]com and I’ll post it.